Aug. 5, 2018—It's hardly how you wanted your summer to go: It's August, and you're sniffling. Maybe your throat feels scratchy too. You swear it feels a lot like the start of a nasty cold. Wait, what? A cold? In summer? Yep, it happens. On average, adults get about two or three colds annually. And while most colds occur when it's, well, colder out, you can get them at any time of the year—even in the dog days of summer. 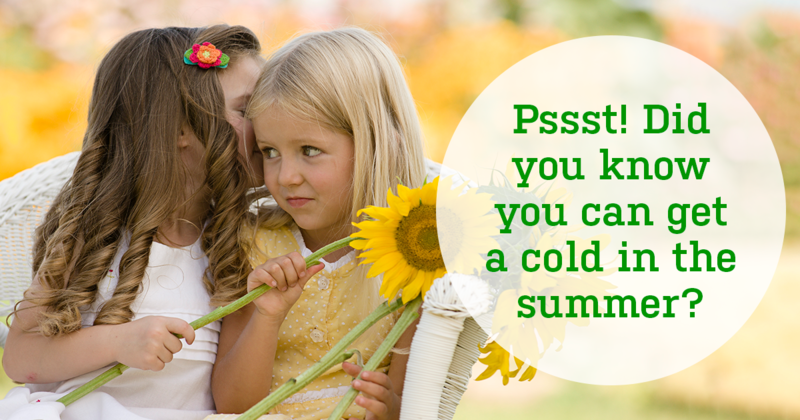 Summer and winter colds tend to have different causes. During the regular cold season, colds are usually caused by rhinoviruses—the most common type of viral infection in humans, the National Institutes of Health (NIH) reports. With summer colds, the usual suspects are non-polio enteroviruses, of which there are more than 60 types, according to the NIH. While rhinoviruses thrive in colder weather, enteroviruses are more active in summer and early fall. Enteroviruses can infect a number of areas of the body, including your nose and throat (like regular cold bugs), as well as your gastrointestinal tract. So along with sneezing, a sore throat and a runny nose, you might get a sudden fever, a headache, body aches and an upset stomach. You can get an enterovirus infection through contact with someone who is infected, from touching a contaminated surface or through contact with the stool of an infected person—for instance, if you change a sick baby's diaper and forget to wash your hands. Over-the-counter acetaminophen for a headache or a fever. A nasal spray or decongestant for a stuffy nose. Ice chips, throat sprays, lozenges or saltwater gargles for a sore throat. Wash your hands often. Scrub them with soap and water for about 20 seconds. (Use alcohol-based hand sanitizer if no sink is available). Keep your distance from sick people—especially if they have a fever (often a sign of infection). Don't touch your face with unwashed hands. When someone in your home is sick, disinfect frequently touched surfaces, like doorknobs and toys. Visit our Colds health topic center to learn more about staying healthy and easing cold symptoms.